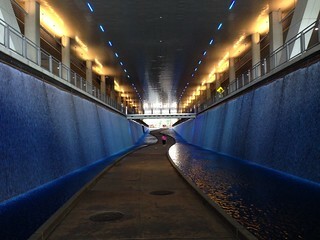 Tenth Street Water Feature pedestrian walkway beneath Pittsburgh's Convention Center. The walls surrounding the path flow with water, and overhead lighting creates an environment that feels safe mood and welcoming. It does feel the cooler - helps to beat the heat during hot & humid summer months.